Many years ago while exploring a small lane in Florence we came upon an art gallery. 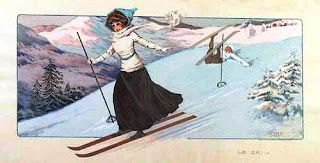 I purchased a lithograph of a woman skiing with one pole. It looked like a water color but it turned out to be pochoir, or a stencil technique. The prints were hand-pulled in small numbers from a lithographic stone and then colored by hand with water colors using as many as 18 stencils. “Le Ski” is by the French artist Gamy in 1910. 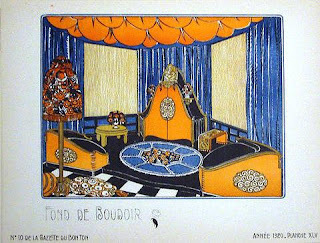 I have loved & collected pochoir lithographs ever since. If you are interested in period fashion and interiors, the beautiful hand-printed pochoir color plates found in this magazine are great! 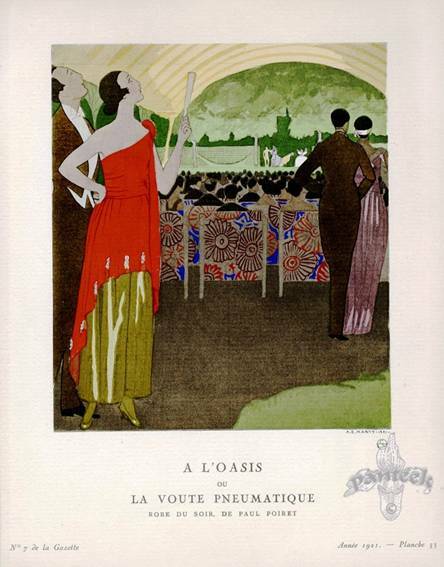 Geared to elite subscribers only, it featured the latest developments in fashion, lifestyle and beauty. 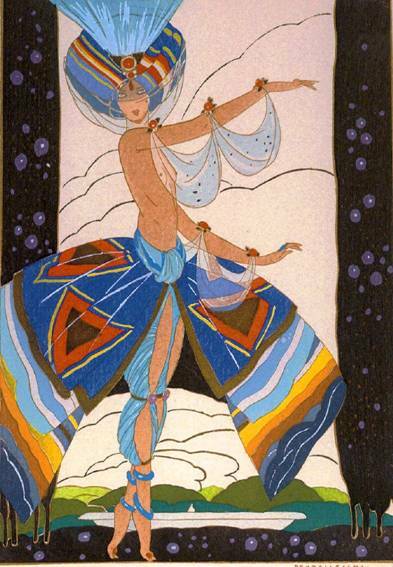 They employed many famous Art Deco artists and illustrators of the day. 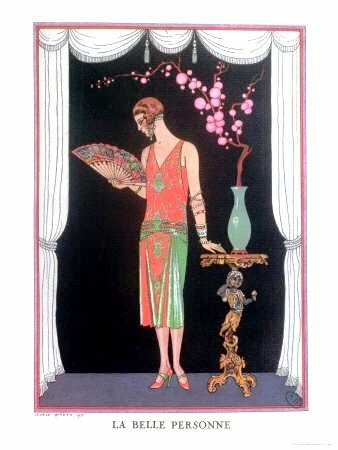 The magazine lasted from 1912 to 1925, and a subscription would cost over $425 a year in today’s money. 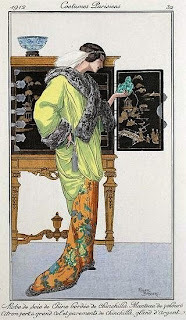 I will share some of my favorite colors plates from this wonderful magazine. 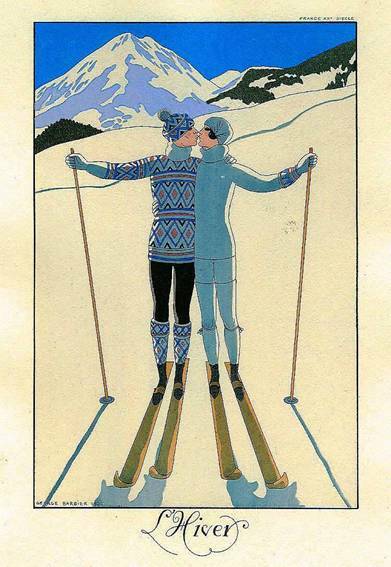 A handsome couple is ready for the slopes in this 1912 color plate. Can you imagine using just one pole! 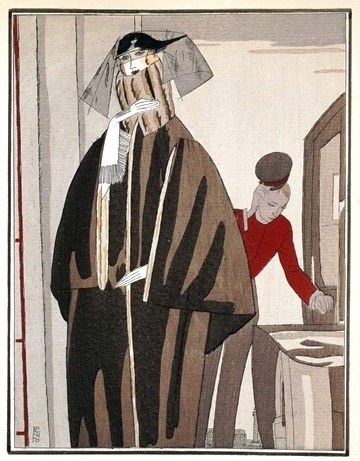 A pochoir print by Eduardo Benito from 1921, depicting a fur coat by renowned designer Jeanne Lanvin. 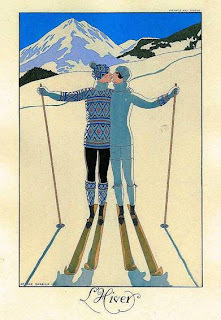 A little smooch before a ski run. 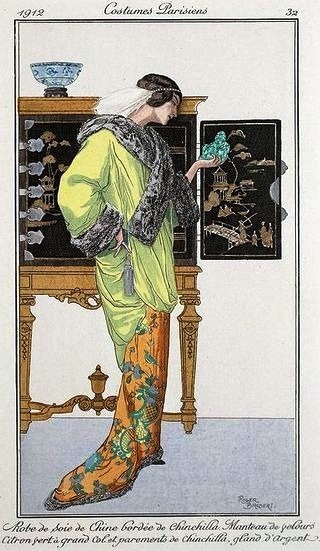 A beautifully dressed woman admires an objet d’art by a chinoiserie cabinet. 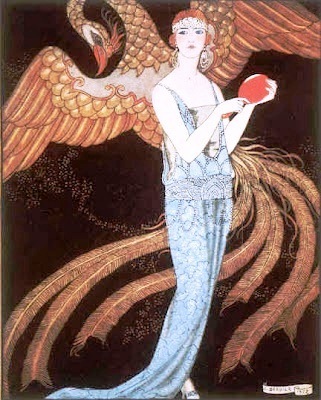 Barbier’s 1922 print depicted a jealous phoenix bird eyeing a beautiful gown by the Paris fashion house of Gustav Beer. 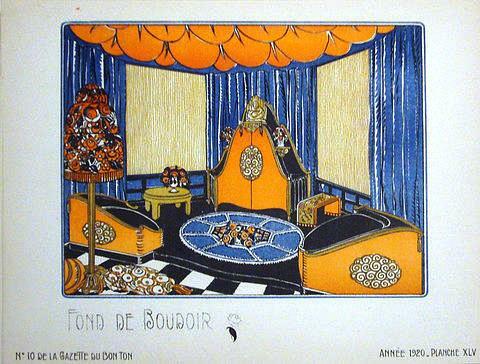 Love the Art Deco upholstery in this 1921 color plate by Marty. 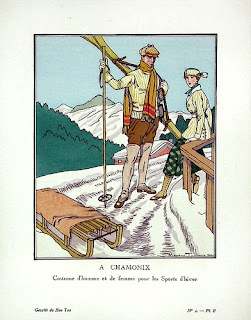 Lithographs from Gazette du bon Ton are surprisingly affordable. When we used to sell them in our Wesco Fabrics Denver Design District showroom, I found many of them at the Marche aux Puces St-Ouen and in many galleries along the rue de Seine in Paris. Interesting and fun info. Thanks for sharing!